Can you tell us a bit about your background working with destinations? I started at Destination British Columbia in 1999. It was called Tourism British Columbia back then. I was the first person they hired to support the website and I was responsible for everything digital. When I left there I was part of the management team and lead a team of more than 12 people. The last four years at Destination Think! I’ve had the opportunity to work closely with dozens of DMOs around the world. I’ve also spoken at more than 50 tourism conferences, and attended even more. It gives me a really good picture of what the challenges are, what the best ways to manage them are, and why. But it’s really our team that makes Destination Think! great. We have about a dozen staff members who used to work at DMOs. Sometimes I think we know our clients better than they know themselves. And that’s what we need, because that’s when we can add real value. We see what works. 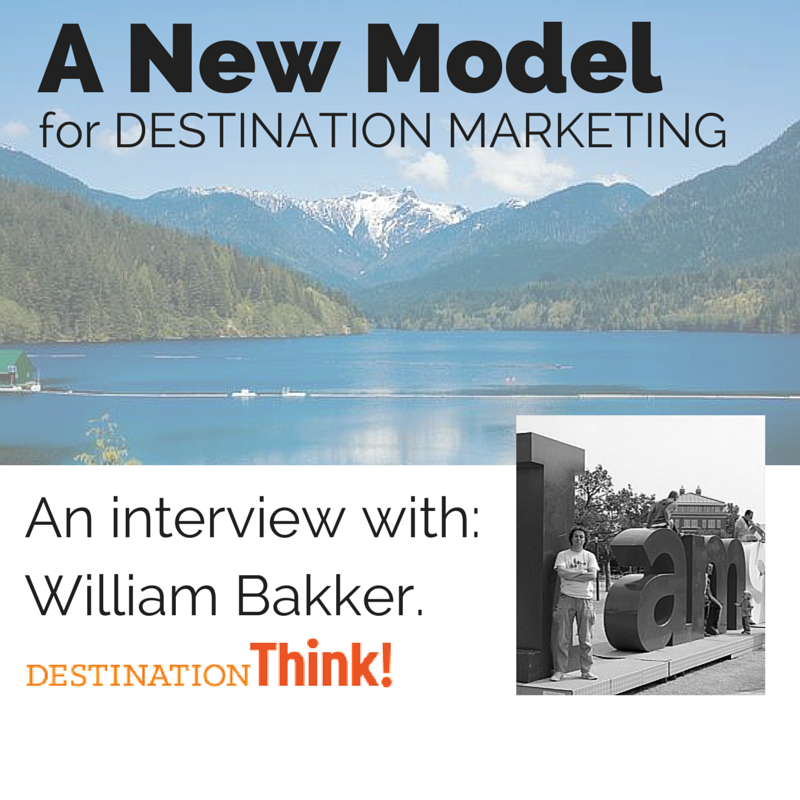 Why do you think there is a need for destination marketing to evolve? Because there is an unbelievably exciting opportunity to be more effective and efficient than a DMO ever has been and to connect better with consumers, provide more value to industry, grow the economy in a sustainable way and improve the quality of life for residents as well. Compared to 15 years ago, we’re dealing with a radically different marketing landscape, a new breed of travelers and global competitors that operate on a level playing field. A DMO can do more with less, manage the politics in much better ways and ultimately deliver real value. It starts by accepting that you can’t build a destination brand yourself anymore because the volume of stories from other people drowns your message out, and they’re also more credible. Word-of-mouth has always been the most important when it comes to travel motivations, but now in social it’s exponentially important. It’s really not that complicated to wrap your head around and it’s all there for the taking. It’s just a different way of thinking and operating. You can see examples of where things are going all around you. DMOs with toes in the water stand out already. And the leaders that move now get a head start. Could you give us some of these examples? Look at how Tourism Australia manages their Facebook page. It couldn’t be simpler, and it’s insanely effective. There’s no way they could ever buy that kind of exposure, even with their deep pockets. Destination British Columbia and others encourage visitors to share their photos in their own channels. Hundreds of thousands of amazing photos shared. And Tourism Queensland worked with influencers in their #Room753 program. Oostende used instagram photographers to source photos for their printed brochure. South Africa is incorporating storytelling into their website that tells the story about Gandhi in South Africa. And Antwerp in Belgium is marketing to the fashion niche by working with fashion influencers. Those are just some examples off the top of my head. There are examples all over. But you know what, most of us know this. Because no matter where I go or who I talk to, everyone agrees with what we’re saying and most agree what the focus and priorities should be. But then change happens very slowly, or not at all. Politics is what often bogs things down. It’s real and we don’t underestimate it. We help our clients deal with it. Because just like marketing has changed, so has communication on the stakeholder side. You can manage the politics in a whole new way as well. By being more open, transparent and collaborative. I’ve seen it work and it’s super exciting. Look at the Usus program Visit Sørlandet is running in Southern Norway. They are training their industry in a very collaborative way and rally them behind a common goal in the process. Eindhoven365 created their brand via a hands-on collaboration with all stakeholders. And I’m not talking about running a few focus groups to create the appearance of collaboration. They really collaborated, and as a result the whole city is bought in. But it’s not the politics that really slow innovation down. It’s often the culture the politics has created that gets in the way. Past mistakes and the fear of a backlash often creates a very conservative and risk-averse culture. As a result, tactics are extremely conservative and safe, often with mediocre results. The people who work at DMOs are great. But they’re often stuck in this culture and they don’t know how to escape it, from the top down to the bottom. Changing a culture is tough. It took time but we figured out a way to do it. Change the culture and magic happens. When we walk into an organization, we do two things: we benchmark the current state of things, through our DMO assessment. We basically go out and talk to everybody in the organization, at least every department. We also try to talk to some stakeholders. We produce a report that documents the current state against best practices. It includes everything, all activities, how they work with stakeholder and the culture as well. Then we create a strategy and a roadmap. The strategy includes the unique things that will make the DMO successful. The roadmap provides focus and is also designed to change the culture. That’s why the priorities are sometimes not necessarily focused on marketing, but on culture. We look at the assessment and identify the places in the organization to address the culture and when. For example, we might need to start by showing a quick win to or for the stakeholders. So we’ll put together a simple project to demonstrate that. People see the results and a light comes on. It can take time. And every DMO is different. But once enough people have seen the light, the whole place tips over and that’s an exciting moment.